A data mart is the access layer of the data warehouse environment that is used to get data out to the users. The data mart is a subset of the data warehouse that is usually oriented to a specific business line or team. 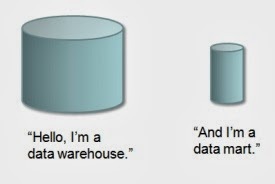 Data marts are small slices of the data warehouse. Whereas data warehouses have an enterprise-wide depth, the information in data marts pertains to a single department. In some deployments, each department or business unit is considered the owner of its data mart including all the hardware, software and data. This enables each department to use, manipulate and develop their data any way they see fit; without altering information inside other data marts or the data warehouse. A datamart is a mini data warehouse, or a subset of data derived from a primary data warehouse. Datamarts are typically stored in the same database server as the warehouse. A data mart is a relational table containing results of a report. A database, or collection of databases, designed to help managers make strategic decisions about their business. Whereas a data warehouse combines databases across an entire enterprise, data marts are usually smaller and focus on a particular subject or department. Some data marts, called dependent data marts, are subsets of larger data warehouses. A data mart is a simple form of a data warehouse that is focused on a single subject (or functional area), such as Sales, Finance, or Marketing. Data marts are often built and controlled by a single department within an organization. Given their single-subject focus, data marts usually draw data from only a few sources. The sources could be internal operational systems, a central data warehouse, or external data. A data warehouse, unlike a data mart, deals with multiple subject areas and is typically implemented and controlled by a central organizational unit such as the corporate Information Technology (IT) group. Often, it is called a central or enterprise data warehouse. Typically, a data warehouse assembles data from multiple source systems. Nothing in these basic definitions limits the size of a data mart or the complexity of the decision-support data that it contains. Nevertheless, data marts are typically smaller and less complex than data warehouses; hence, they are typically easier to build and maintain. Table A-1 summarizes the basic differences between a data warehouse and a data mart. What Are the Steps in Implementing a Data Mart? Set up an intermediate layer for the front-end tool to use. This layer, the metalayer, translates database structures and object names into business terms, so that the end user can interact with the data mart using terms that relate to the business function. Maintain and manage these business interfaces. Set up and manage database structures, like summarized tables, that help queries submitted through the front-end tool execute quickly and efficiently.